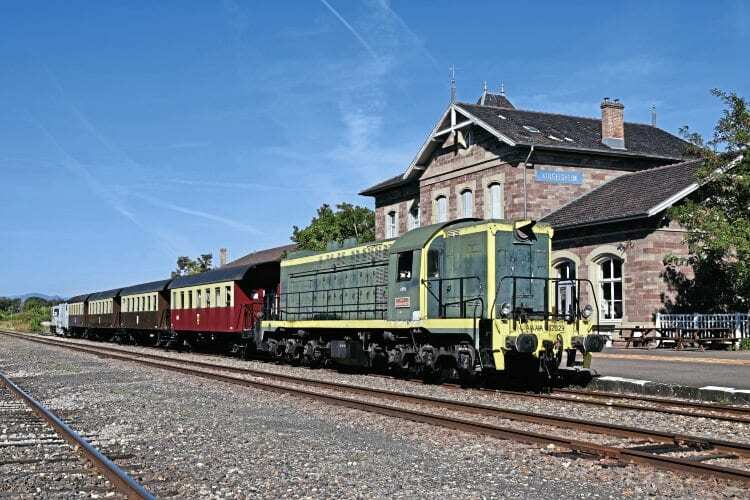 IN SEPTEMBER there was a rare opportunity to travel in a passenger train operated by one of the 70-year-old former French Railways (SNCF) Baldwin-built diesel locos at the Chemin de Fer Touristique du Rhin heritage line, near Colmar, in Alsace. The train was organised by the UK-based enthusiasts behind the European Traction website. American loco builder Baldwin built several thousand diesel locos between 1945 and 1956, mainly for North American customers, but exported 401 locos to countries as diverse as France, Algeria, Argentina and the Soviet Union. Baldwin stopped loco production in 1956, so working Baldwin-built locos are hard to find anywhere these days. Several exist in museums in the USA and Argentina, but very few are operational. At the end of the Second World War, SNCF had lost more than 80% of its loco fleet either through war damage, neglect or following transfer to other countries by the occupying German forces. More than 1,400 new 2-8-2 steam locos were built in the UK, Canada and the USA to replace them, but an order was placed by SNCF for 30 diesels with Baldwin in August 1945.